Adapted under a CC-BY 4.0 license from the The 30-Day Impact Challenge: The Ultimate Guide to Raising the Profile of Your Research eBook published by Impactstory.org and authored by Stacy Konkiel. In a competitive research landscape, researchers can no longer afford to just publish and hope for the best. To leave a mark, researchers have to take their impact into their own hands. But where to start? There are so many ways to share, promote, and discuss your research. It’s tough to know where to begin. Luckily, we’re here to help. 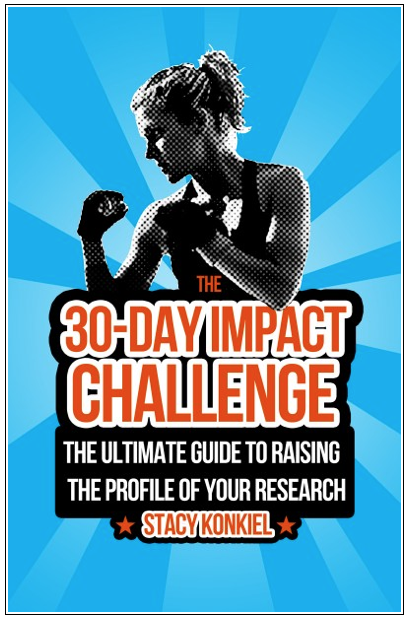 Adapted from The 30-Day Impact Challenge: The Ultimate Guide to Raising the Profile of Your Research by Stacy Konkiel, we have a series of steps you can take to make sure your hard work gets out there, gets attention, and makes a difference—both in your field and with the public. If you’re up to the challenge, we're confident that by the end of the week, your research will get a boost in exposure. Today's Challenges focus on the theme of Identity: Building Your Academic Profile. Building your academic profile online can help demonstrate your authority, expertise and research interests. The internet has become the starting point for all searches, so you want to make sure that people are finding authorized biographical and contact information about you. This is especially important when you're starting your academic career. In these three Challenges, we'll show you how to create your unique scholar identifier, get you onto Google Scholar and help you increase your Googleability, and develop your profile on an academic social network. Drop in and work on any of the previous Challenges. Librarians will be available for assistance. Today's Challenges focus on the theme of Community: Connecting with other Researchers. Sharing your work is not only a way to connect with your academic community but also a way to build your online profile as a scholar in an area. In these three Challenges, we'll show you how to curate an open bibliography to share your knowledge with others, engage with your research community on Twitter, and supercharge your LinkedIn profile. Today's Challenges focus on the theme of Alerts: Keeping Informed. They focus on being impactful in an indirect way - by staying on top of your field. Staying on the cutting edge of your discipline can help you find unexpected opportunities for collaboration and spark your own creativity. In these three Challenges, we'll show you how to create alerts that will send information directly to our inbox on key scholars in your field and on new publications in your field of research. We'll also look at how to determine who's citing you - get notified when someone discusses or shares your work online. Today's Challenges focus on the theme of Measuring: Metrics & Analytics. Scholarly metrics are a way for the impact of an article, author, or journal to be measured. Traditional scholarly metrics count publications and citations in journals, books, etc. Altmetrics are new metrics that count numbers of downloads, views, comments on scholarly websites and blogs, etc. In these three Challenges, we'll look at a variety of metrics and tools, including traditional and altmetrics. We'll show you how to find top ranking journals in your field using Journal Citation Reports, track your scholarly social media and website impacts, and discover how to determine article and author level citation counts on Web of Science and Google Scholar.